At age 54, USC student Lisa Misraje stands out from the majority of her fellow Trojan undergrads in their 20s. A divorced mother of six, Misraje commutes to campus from Riverside and also cares for her mother. She will graduate this spring with Bachelor of Arts in Non-Governmental Organizations and Social Change and Master of Public Administration degrees. Misraje came back to the U.S. and enrolled at USC as a first-generation college student after spending several years in China building orphanages and serving people in need. She said she’s been asked why she’s attending college now. Misraje believes that questions around being an older student spring from stereotypes that older people aren’t in need of higher education and that people her age should be preparing to leave the workforce, not start new careers. Janette Brown (2nd from left) and Caroline Cicero (center) listen to members of the USC community sharing their opinions on how to make campus more age-friendly. USC Leonard Davis School of Gerontology Associate Professor and Assistant Dean of Diversity and Inclusion Susan Enguidanos said fighting stereotypes in the classroom is critical as more older people seek higher education to enhance or reshape their careers. “We’re going to see growth in older students, especially with the growth in online programs,” she explained. 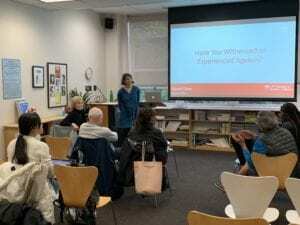 Enguidanos and Paul Nash, instructional associate professor of gerontology, discussed how to better support and engage older students during a presentation USC Diversity, Equity and Inclusion Week. Age discrimination is a unique kind of discrimination because it’s essentially “prejudice against our future selves,” Nash said. Nash and Enguidanos shared ideas for making classrooms more age-friendly. Using more inclusive language to talk about aging and older people, providing more information about technology training available to students, creating opportunities for older individuals to share their knowledge gathered from their life experiences, and hiring counselors with knowledge in serving older students were some of their ideas. At USC, more than 2500 undergraduate and graduate students are 40 years old or older. In addition, 30 percent of USC staff members and half of faculty members are 50 or older. There are also numerous older alumni, retired staff and faculty, research participants, and other older members of the community visiting USC on any given day, said Janette Brown, assistant vice provost at the USC Emeriti Center and adjunct faculty member at the USC Leonard Davis School. Brown and Caroline Cicero, USC Leonard Davis instructional associate professor and director of the USC Age-Friendly University initiative, hosted a second USC Diversity, Equity and Inclusion Week presentation on overcoming ageism and promoting more intergenerational activities on campus. They discussed how to improve age-inclusivity on campus for all Trojans and visitors. “This is the first year that ageism has been included in Diversity, Equity and Inclusion Week events, and I look forward to using ideas and suggestions from our community to make USC a more age-friendly university,” Cicero said. Misraje said that her time at USC has been filled with exciting learning experiences and activities with new friends of all ages, especially her fellow Norman Topping Scholars. Her tenacity and support system have helped her surpass challenges—from mastering new technology to finding quiet time to study in a busy home—and succeed at USC. After first following her dream of service work in China, “I’m living my second dream life,” she said. Above: Lisa Misraje ’19, MPA ’19 will graduate from USC this spring at age 54.